ASTORIA — He was a "force of nature" whose death in an East Harlem explosion "took everything." 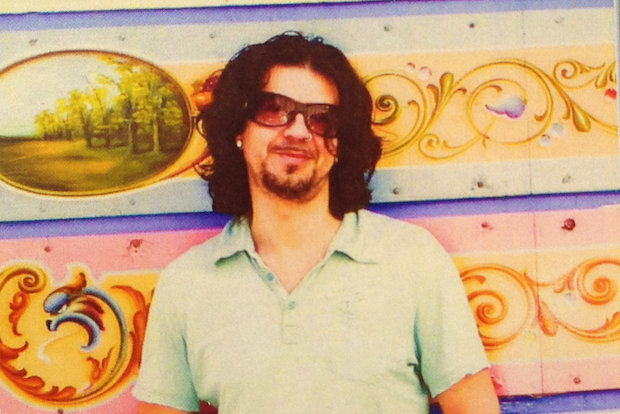 Greek musician Andreas Panagopoulos, who was sleeping at home on East 116th Street Wednesday when his building was leveled by the blast, was remembered at a funeral service Sunday. "He was one of a kind," Liseth Perez, Panagopoulos' wife of 12 years, said before the service at the Farenga Funeral Home in Astoria. "He was the most romantic person, even though he was big and tall. But he was just so romantic. "He told me every morning how beautiful I looked. He spent one month looking for the best present for me for every birthday." Perez, who works as an editor at the newspaper El Diario, said she left home at 8:15 a.m. Wednesday while Panagopoulos, a musician who worked from home in advertising, was still asleep. She first heard about the explosion when people began calling her to ask how she was. "I just started calling him right away and he never answered the phone," she said. She held out hope that he was among the 60 or so injured, she said, until she was called to the medical examiner's office to claim his body. "I was hoping that one of those people who was in the hospital was him," she said. "But obviously it wasn't." Panagopoulos, 44, was one of eight people killed in the sudden explosion investigators say was likely caused by a gas leak. It left dozens, including his wife, homeless. As investigators continue to piece together what caused the deadly tragedy, colleagues and friends have come out to support Perez with an online fundraiser, which has so far raised over $26,000. She said the blast "took everything away from me." "They took my love," she said. "They took the person that I spent 13 years of my life with." Panagopoulos' friend Richard Orridge, 70, called him a "force of nature." "Andreas was like fire, but a warming fire," he said. "You always felt he was bringing the best of you out... You felt an instant connection. You could not help but feel a connection to him." Abi Laoshe, 43, first met Panagopoulos 20 years ago while working in advertising sales. "He had a huge reputation as 'the big Greek,'" he said, and they became friends. He last saw him on East 116th Street a few weeks before the explosion. "He allowed you to be you," he said. "He had a great habit of bringing up strays, and he lifted them up." The service program featured a photo of a smiling Panagopoulos. Underneath were the words "Zoe Se Mas" — Greek for "those who die give us life." The ceremony closed with a reading of the poem The Return of the Exile, written by the Greek poet Giorgios Seferis, which is about a man returning home to the country after being away for years. His family plans to bury Panagopoulos in Greece, which he visited every summer with his wife.